It is not always possible to have the ability to go for the big light shows, though they look absolutely stunning. One can make such things out of stuff which we already have around. For example, LED lights can be convenient as they are cheaper and you can use them after Halloween in your holiday decor. Stop wasting money on expensive Halloween decorations and start applying our ideas and your crafty skills to have an amazing decoration at your place. 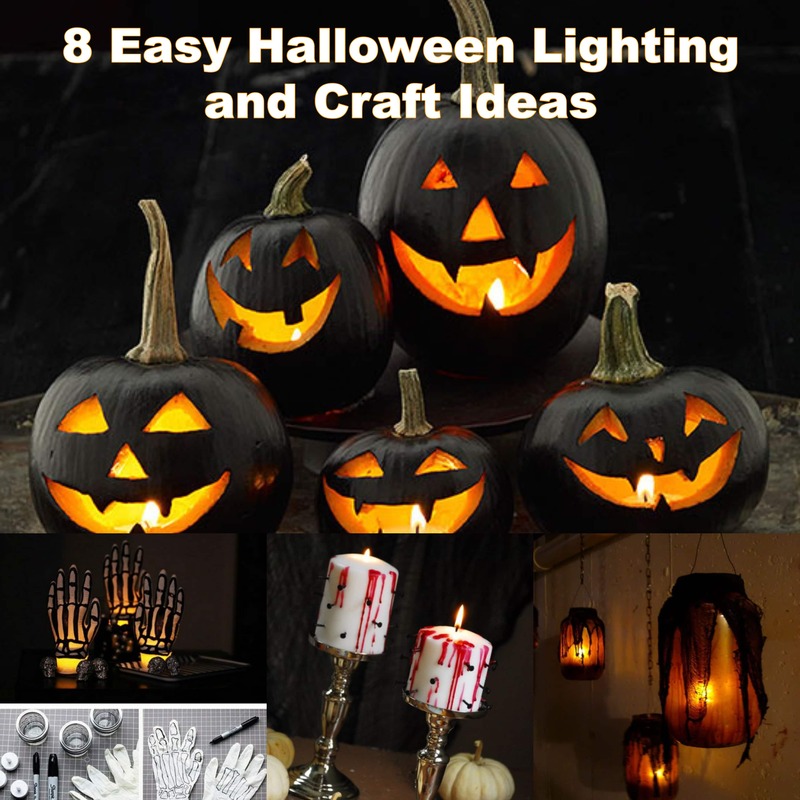 These easy lights will surely spice up your Halloween night. Kids are most likely expected to come in for candies. 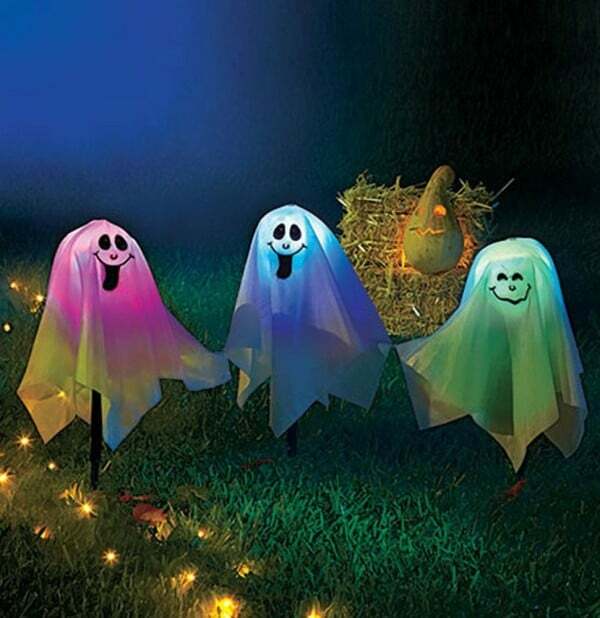 Nothing other than these colorful Ghosts will attract them better. A bit of happiness can provide them with a happy welcome. You just have to stick some rods to the ground, place a bowl or any round sort of thing that contacts with the top of the rod. Now take a bunch of colorful LED lights and place it on the top, put a white cloth over the rod painted in funny faces and turn on the lights. These ghosts even change colors! This one’s easy to make and will add on to your Halloween theme. All you have to do is- get plain jars and add a yellow light each jar. Cover them with uneven tight black netting and hang them where you want them to be. For more effects, use a light hand over orange spray on the jars. Wait for the night to come, you’ll be surprised! You can make the ghost garland however you like- spooky or cute. Both maybe. Begin with cutting 10 squares of white cloth and fold them into triangles, cut a hole on the tip to thread the light through it. Placing the cloth over these small lanterns, tie a piece of string around the bottom to hold the fabric in place. Now draw funny or ghostly faces over these and hang them. Your little ghosts are ready! 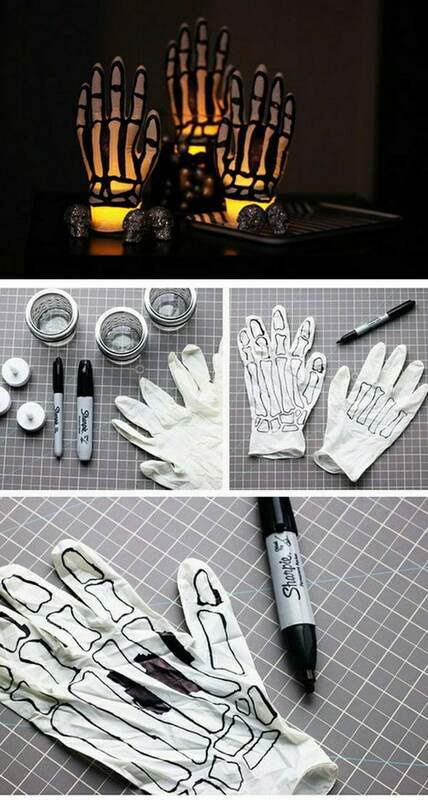 Take a latex glove and use a black marker to sketch out some bone shapes over it. To be precise with the drawing, pull out some skeleton hands from Google images. Once you’re done, turn on a flameless LED tea light into small Mason jars without the lid and stretch the opening of your skeleton glove around the jar so it fits well. To uphold it right, blow some air into the glove and you’re done. These candles will add on to the occasion. To make them is as easy as it looks. Take small black colored pins and pierce white candles of different sizes. Drip red wax down the sides to make them look bloody. Place these candles on candlesticks for better effect. For making these, you will need materials that you already have in hand. Use old glass jars to begin with and color them with glass paints of your choice. For nice pumpkin effect, use orange and yellow. 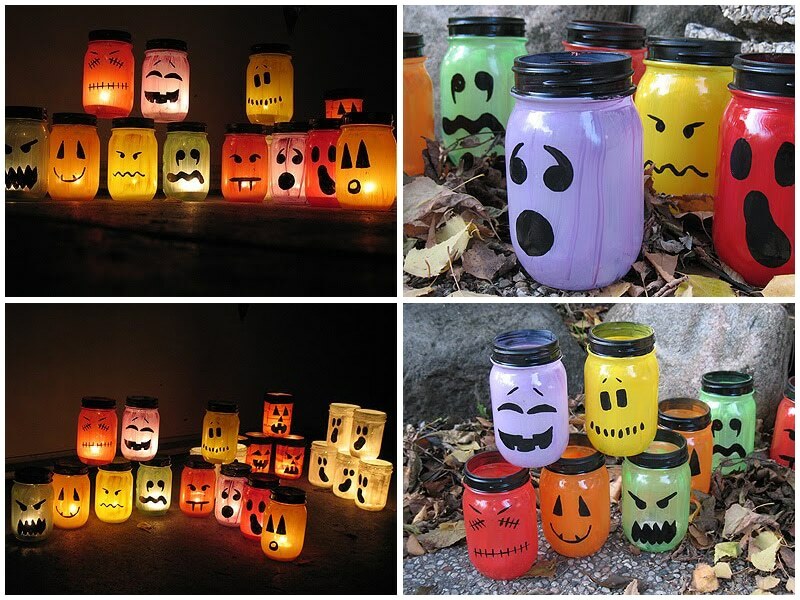 With the help of a black permanent marker, make funny or ghoulish faces on each jar. To lighten them up, put inside a candle and you’ll see the faces come to life. 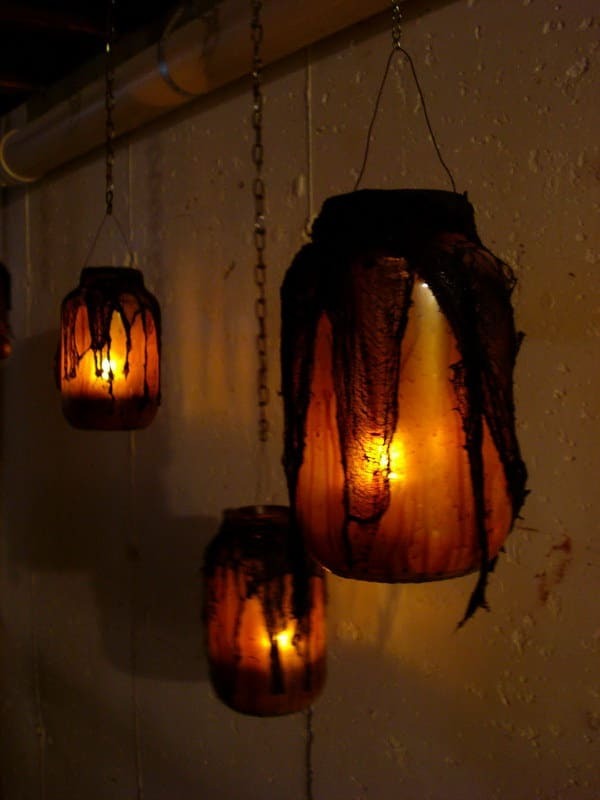 These lanterns will create an ambient glow no matter where you decide to place them. 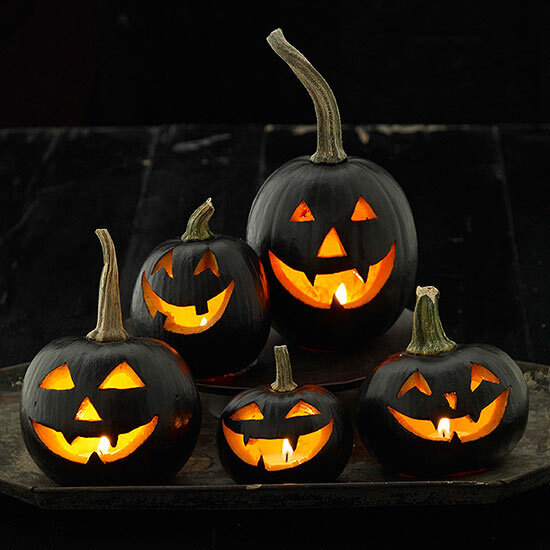 Get yourself different sizes of Jack-o’-lanterns and simply paint these with black acrylic color or spray paint. To keep the stem color free, in order to keep the original look, use painters tape around it. These grinning faces will be all you’ll see on All Hallow’s Eve. You can place these pumpkins outside your doorstep, where there’s enough darkness to create a unique illusion. This little Halloween carved orange light is a perfect example of best out of waste. Take an orange, make sure you take out all the segments and then carve out different faces and place candles in them. These will look best on your dinner table for Halloween parties. 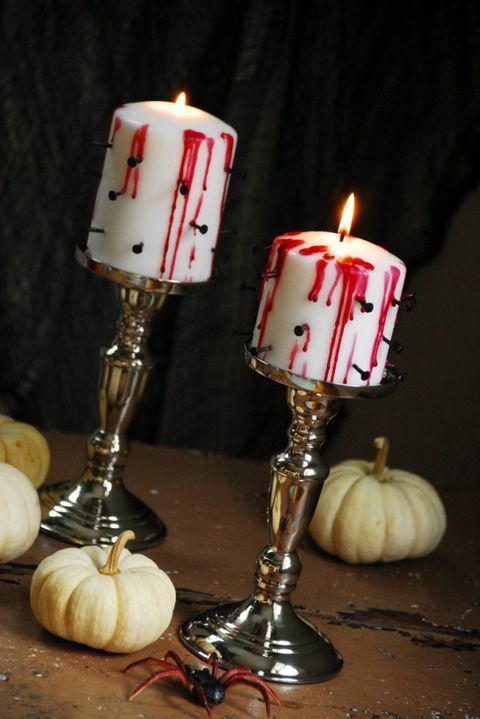 These fun mood lighting ideas will enhance your Halloween decorations. You can make your house party the most stylish and festive one.